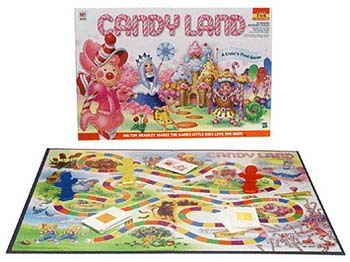 Candy Land game - the classic one. Captivated by the story of a kidnapped king and eager to help find him, little ones move their gingerbread pawns along a rainbow path and through a land of candy characters, all subjects of King Kandy's realm. Playing cards thoughtfully designed for non-readers are coded with colorful squares matching the jeweled stepping-stone path or an occasional token matching one of the characters' symbols: draw a blue card, move to the nearest blue stepping-stone; draw a snowflake and earn a visit to Queen Frostine's iceberg. There are occasional pitfalls, too: land on the wrong square and you might be stuck in Molasses Swamp until a red card is drawn. With all these enticing, sugarcoated images (and King Kandy plainly visible at path's end), children can't help but be delighted by Candy Land. It's delicious. Instructions are in both Spanish and English. Candy Land is for two to four players) For generations, boys and girls have enjoyed Candy Land as their first board game. The color-themed game requires no reading on the part of the players and is easy for even the youngest of children to follow. Players move their primary-colored gingerbread people around the rainbow path, moving through the Peppermint Stick Forest by matching the color spaces to the colors on the pick deck. The player who reaches the Candy Castle first wins. This game is suitable to two to four players, children and adult and children can even play it alone. As a primary learning game, Candy Land fosters a child's exposure to following directions, taking turns, color recognition and count skills. The game promotes thinking as well as patience in the form of waiting one's turn to play. By play games with others, children are encouraged to socially interact in a more controlled manner, which helps develop character for future endeavors.